Meanwhile Old Whateley continued to buy cattle without measurably increasing the size of his herd. He also cut timber and began to repair the unused parts of his house—a spacious, peak-roofed affair whose rear end was buried entirely in the rocky hillside, and whose three least-ruined ground-floor rooms had always been sufficient for himself and his daughter. There must have been prodigious reserves of strength in the old man to enable him to accomplish so much hard labour; and though he still babbled dementedly at times, his carpentry seemed to show the effects of sound calculation. It had already begun as soon as Wilbur was born, when one of the many tool sheds had been put suddenly in order, clapboarded, and fitted with a stout fresh lock. Now, in restoring the abandoned upper storey of the house, he was a no less thorough craftsman. His mania showed itself only in his tight boarding-up of all the windows in the reclaimed section—though many declared that it was a crazy thing to bother with the reclamation at all. Less inexplicable was his fitting up of another downstairs room for his new grandson—a room which several callers saw, though no one was ever admitted to the closely-boarded upper storey. This chamber he lined with tall, firm shelving, along which he began gradually to arrange, in apparently careful order, all the rotting ancient books and parts of books which during his own day had been heaped promiscuously in odd corners of the various rooms. When Wilbur was a year and seven months old—in September of 1914—his size and accomplishments were almost alarming. He had grown as large as a child of four, and was a fluent and incredibly intelligent talker. He ran freely about the fields and hills, and accompanied his mother on all her wanderings. At home he would pore dilligently over the queer pictures and charts in his grandfather's books, while Old Whateley would instruct and catechize him through long, hushed afternoons. By this time the restoration of the house was finished, and those who watched it wondered why one of the upper windows had been made into a solid plank door. It was a window in the rear of the east gable end, close against the hill; and no one could imagine why a cleated wooden runway was built up to it from the ground. About the period of this work's completion people noticed that the old tool-house, tightly locked and windowlessly clapboarded since Wilbur's birth, had been abandoned again. 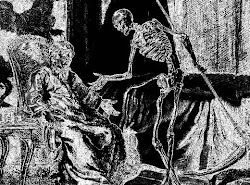 The door swung listlessly open, and when Earl Sawyer once stepped within after a cattle-selling call on Old Whateley he was quite discomposed by the singular odour he encountered—such a stench, he averred, as he had never before smelt in all his life except near the Indian circles on the hills, and which could not come from anything sane or of this earth. But then, the homes and sheds of Dunwich folk have never been remarkable for olfactory immaculateness. The following months were void of visible events, save that everyone swore to a slow but steady increase in the mysterious hill noises. On May Eve of 1915 there were tremors which even the Aylesbury people felt, whilst the following Hallowe'en produced an underground rumbling queerly synchronized with bursts of flame—'them witch Whateleys' doin's'—from the summit of Sentinel Hill. Wilbur was growing up uncannily, so that he looked like a boy of ten as he entered his fourth year. He read avidly by himself now; but talked much less than formerly. A settled taciturnity was absorbing him, and for the first time people began to speak specifically of the dawning look of evil in his goatish face. He would sometimes mutter an unfamiliar jargon, and chant in bizarre rhythms which chilled the listener with a sense of unexplainable terror. The aversion displayed towards him by dogs had now become a matter of wide remark, and he was obliged to carry a pistol in order to traverse the countryside in safety. His occasional use of the weapon did not enhance his popularity amongst the owners of canine guardians. The few callers at the house would often find Lavinia alone on the ground floor, while odd cries and footsteps resounded in the boarded-up second storey. She would never tell what her father and the boy were doing up there, though once she turned pale and displayed an abnormal degree of fear when a jocose fish-pedlar tried the locked door leading to the stairway. That pedlar told the store loungers at Dunwich Village that he thought he heard a horse stamping on that floor above. The loungers reflected, thinking of the door and runway, and of the cattle that so swiftly disappeared. Then they shuddered as they recalled tales of Old Whateley's youth, and of the strange things that are called out of the earth when a bullock is sacrificed at the proper time to certain heathen gods. It had for some time been noticed that dogs had begun to hate and fear the whole Whateley place as violently as they hated and feared young Wilbur personally. In 1917 the war came, and Squire Sawyer Whateley, as chairman of the local draft board, had hard work finding a quota of young Dunwich men fit even to be sent to development camp. The government, alarmed at such signs of wholesale regional decadence, sent several officers and medical experts to investigate; conducting a survey which New England newspaper readers may still recall. It was the publicity attending this investigation which set reporters on the track of the Whateleys, and caused the Boston Globe and Arkham Advertiser to print flamboyant Sunday stories of young Wilbur's precociousness, Old Whateley's black magic, and the shelves of strange books, the sealed second storey of the ancient farmhouse, and the weirdness of the whole region and its hill noises. Wilbur was four and a half then, and looked like a lad of fifteen. His lips and cheeks were fuzzy with a coarse dark down, and his voice had begun to break.